Confessions of a Hungry Woman: Gorgeously Gooey. I once offended a baker at a food market by asking if the meringues he was selling were 'nice and sticky' on the inside. 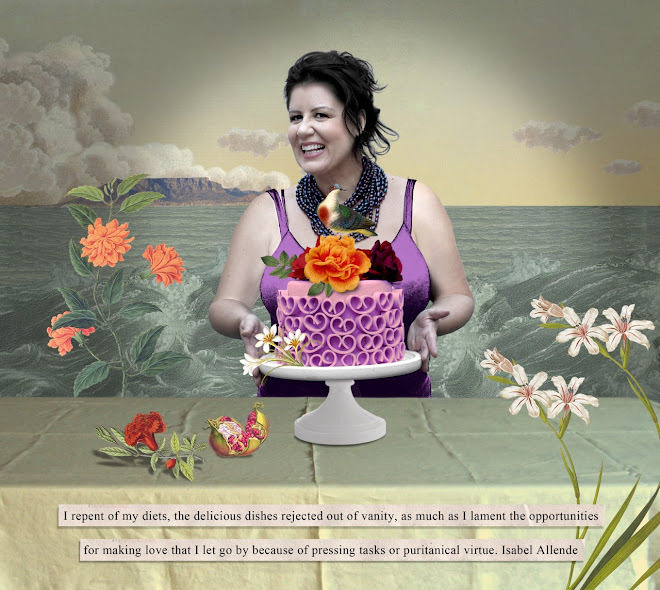 'Lyk ek vir jou asof ek kak meringues bak?! Translated: 'Do I look like I make crap meringues?!' 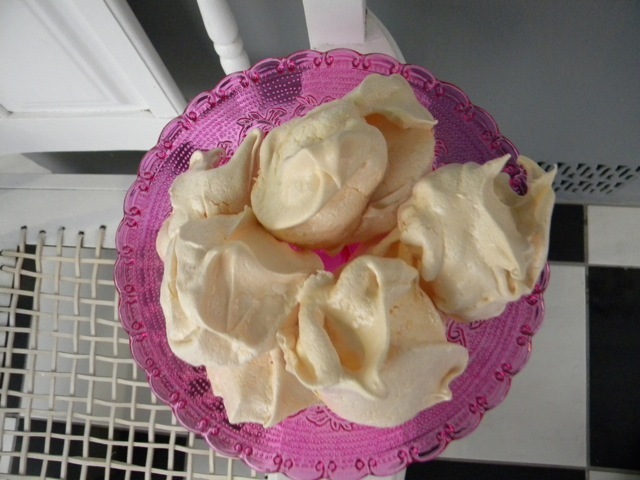 So clearly meringues, Pavlova being the only exception, should not be sticky on the inside. But sadly that's how I like them. Which means that I give the hugely generous, non-sticky sugary French meringues a big miss, unlike my mom, who buys and eats two as can be seen in this photo taken in Lourmarin. So when I do buy meringues, I open the packet and leave them for a day or two, before I eat them. I am, after all, such a sophisticated creature. But last night, having made ice-cream and been left with 4 egg whites which I was about to throw away, I suddenly decided to google meringue recipes. There were many complicated, intimidating ones, but a few looked easy enough, especially those with only two ingredients. So here is my version. But seriously, I wouldn't try and beat it by hand. Way too much trouble. I used the beautiful cherry red KitchenAid Mixer that I received for my 40th birthday last year. But you can use, whatever electrical thingy that you have. Whisk egg whites until the mixture forms soft peaks. While whisking gradually add the sugar, spoon by spoon, until quite stiff peaks are formed. Scoop the blobs out and place on a baking tray and bake for about 1 1/2 hours - 2 hours. I loved the way they looked on our kitchen counter , 12 organically shaped glistening pearlescent cream blobs, prettily proving that I am slowly, slowly making my way in the kitchen. Now, I know this doesn't much look like I'm trying to lose weight or to eat healthily, but I'm enjoying making peace with food, and overcoming my kitchen fears. It's a weird way of doing this, I know, but then, occasionally weird is good. 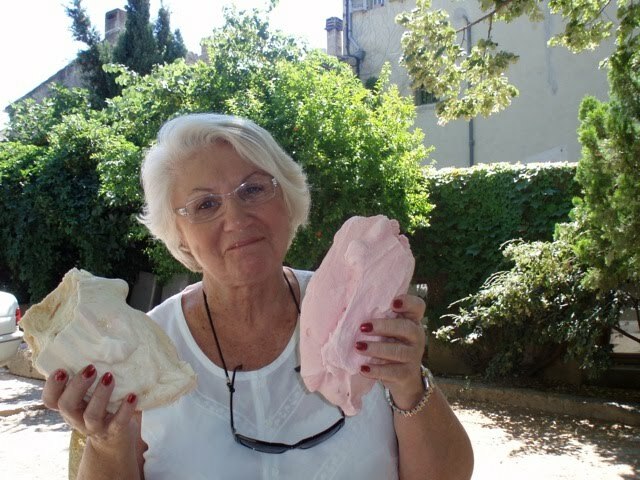 Like my mom choosing to eat two large meringues for lunch instead of lovely steak-frites when in Provence. Ice cream in winter!? Come on Sammie, do us a Malva Pud! Ek hoop Caroline het daai blerrie meringues geniet!! I think you should use Xylotol in your meringues too... no, jokes aside, I have tried and it works, but it cannot be sticky, you have to cook and overcook them!! @Lise. Malva pudding is best bought at Woolies... But my attempts ( as my Marie mentions) at Bread and Butter Pudding are encouraging... Will post as soon as I'm sure whether I like the one with white chocolate or figs.... See how daring I am?